WE ARE NOT A SHELTER. We cannot take your pet. Call 311 in Dallas. 1) Send an email with a picture to Animal Alert! with any details to help get your pet home. 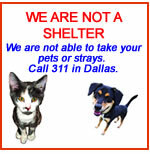 3) Email Tony at Dallas Animal Services at daslost@dallascityhall. 4) Go to PetHarbor.com. Enter your zip code, then check the shelters you want to search. Follow the directions to search for your pet. 6) Call or leave flyers at all Vets in the area. 7) E-mail all neighbor's and neighborhood association. 8) Check the Shelters in person EVERYDAY! 1) Make sure your pet wears a tag all the time - the easiest way to make sure your pet gets returned to you. 4) Make a Lost Pet Emergency Kit - current photos of your pet, detailed description of your pet, etc.